To prevent such injuries, a custom-fitted, professional-grade mouth guard is a must! Experts in sports dentistry in the USA indicate that the lifetime rehabilitation cost of major oral injuries can approach hundres of dollars per tooth. This does not include cost for secondary problems such as periodontal disease that often accompany such problems. The total rehabilitation costs of a single knock-out tooth are more than 20 times the preventive cost for a custom-made professional-grade mouth guard. There are three kinds of mouth guards. Depending on design and material used, they vary in fit, rate of protection, ease of maintenance, longevity, and cost. a. ready made or stock mouth guards. These are usually found and sold in sporting goods store and are usually a "one size fits all" mouth guard. These mouth guards are the least expensive but they also offer the least protection because of their poor fit. They are usually made of rubber or polyvinyl material. The most they do is provide a false sense of security. b. "boil and bite" mouth guards. Also sold in sporting goods stores. They usually come in a u-shaped mass of thermo-plastic material that becomes soft when placed in hot water. When soften, the user places them in their mouths and they bite their teeth together to form the mounth guard, thus the name "boil and bite". These mouth guards provide minimum protection because of the dramatic decrease in thickness when the athlete bites into it during its softened state. At the very most they are slightly better than the stock mouth guards as they fit a little better. However, they are usually bulky and cumbersome. they also interfere with the breathing and speaking ability of the user. Effective mouth guards must be resilient, tear resistant and comfortable. They should fit properly, are durable, easy to clean and not restrict speech and breathing. Only a dentist fabricated custom-made, professional-grade mouth guard satisfy all the above features. Athletes, particularly those involved in contact sports like boxing and taekwondo must wear a custom mouth guard to prevent oral and facial injuries. These mouth guards help cushion blows that might cause broken teeth, injuries to the lips, tongue, face or jaw. They also reduce the severity and incidence of concussions, a common incident in major contact sports, particulary, boxing. Lately, I have seen Filipino boxers at my Canoga Park office, a suburb of Los Angeles, California. The most noteworthy are Manny Pacquiao and his brother Bobby. 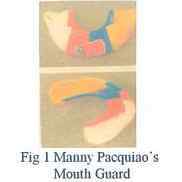 Manny used one of our custom-made, professional-grade mouth guards during the Morales fight in Las Vegas and the Velasquez fight at the Staples Center. Bobby will also be using one when he fights at Las Vegas on October 8th. I congratulate the Pacquiao brothers and their respective handlers for being smart enough to know that there are tangible values in a custom-made, professional-grade mouth guards. Sadly, not all handlers of Filipino boxers are the same. Thus, we wrote this article. It is my hope that they will come to realize that there is more to managing boxers than booking fights for them. Their long term health must be protected at all cost. That can begin with a custom-made, professional-grade mouth guard. 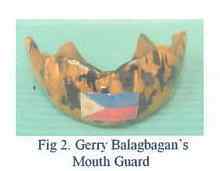 The practice of making Filipino fighters use shoddy mouth guards (Fig. 4 and 5) must be put to a stop. Dr. Ed de la Vega is a graduate of the University of Southern California School of Dentistry. He is a Fellow of the American College of Dentists, International College of Dentists, Academy of General Dentistry and the Academy of Dentistry International. He is also a former Member of the California State Board of Dental Examiners and a Past President of the Los Angeles Dental Society and the Southern California Filipino Dental Society. He has been in practice in California since 1971. 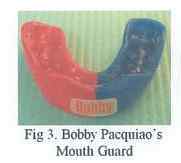 Publisher's note: Dr. de la Vega has offered to make a custom made mouth guard free of charge to every Filipino boxer who get booked to fight in the U.S. particulary those whose fights are close to Los Angeles area. Doc Ed can be reached at (818) 348-8713.